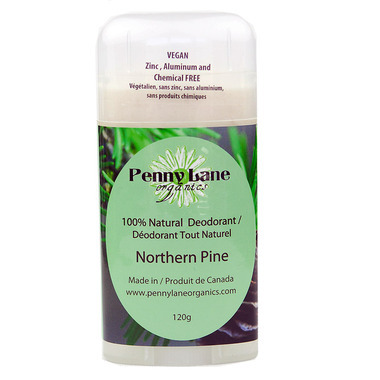 Penny Lane Organics Natural Deodorant is made with pure essential oil of Scotch Pine, coconut oil, baking soda and organic corn starch. It will keep you dry and smelling fresh. This scent is very popular with men for its strong earthy fragrance. Usage: Apply in 3 to 4 gentle swipes. Can be used dry or wet. Do not use immediately after shaving or waxing the armpits or on the broken skin. Baking soda can be irritating to some people. If irritation occurs stop using the deodorant and apply a soothing natural cream or balm. Ingredients: Cold pressed coconut oil, NON-GMO corn starch, Baking soda, Pine essential oil. This deodorant smells amazing! It is a woodsy, sort of masculine fragrance, but sweet and light enough that even I use it from time to time. Because of its all-natural ingredients it requires a little bit of effort to put on. What I do is put it on right after stepping out of the shower, rub it on to wet skin, and then massage it in for a few seconds. Or I dampen it under the tap and then put it on. It really does need to be damp or wet to apply properly. And it also does leave a white residue, so be careful when putting on dark clothing. This stuff smells so nice though, it's worth the extra minute in your day to apply it! Unfortunately this product crumbled to pieces. Works fairly well. I had to throw it out after only a few uses. Attempted dry & wet application. Cannot recommend. Love the brand and the smell, but I was very disappointed. I know it says to wet if it seems too dry, mine was so dry when I opened it up it all crumbled and fell onto the floor. I only got to use it once befor it all fell apart. Won't re buy. I have been searching for a natural deodorant that actually works and lasts long and haven't been able to find one. Most last a couple hours and then wear off. This one actually works. I'm a heavy sweater and at the end of the day I still smell good. Awesome! Works really well! Lasts till the end of the day. It's a very nice product! You need to be careful how to use it though, as it is natural and falls to pieces. Very nice product. I like the smell ( and my wife likes it too). Took me few days to get used to it until my wife read the instructions and told me to wet it. She also said someone told her it can be used over sweaty armpits to eliminate existing bad odour. I tried it and I'm a happy guy now. It works! Smell was great and seemed like it might last, but it flaked all over. Made such a mess I just threw it out. Works great, smells great and great value too. This is the biggest deodorant I ever bought (120 g ???) I think it will last forever.